As part of the University's Sustainability Week events, dozens of representatives will be on campus offering information, travel discounts and give-aways. There will even be a little fun! Try out the driving simulators that imitate drunk driving and what it's like to be in a car crash, with and without a seatbelt. Be sure to enter to win RACE TICKETS to Bojangle’s Pole Night Thursday, Oct. 6, the BC&BS Drive for the Cure 300 Friday, Oct. 7, or the Bank of America 500 Saturday, Oct. 8 courtesy of Charlotte Motor Speedway. Whether by wheels or by foot, make plans to be there! Parking and Transportation is excited to be part of this event. 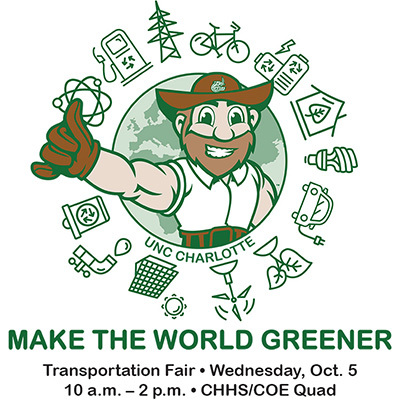 Learn more about transportation options at UNC Charlotte and campus sustainability efforts. The rest was generated from F/S premium gated access fees, and visitor parking fees, etc. ($1,886,691 came from visitor/short-term parking, including conferences, meters, visitor deck pay stations and visitor parking vouchers). $1,086,656 went to utilities, gate equipment, permit printing, credit card fees, insurance, maintenance contracts, etc. Income was up over last year, which correlates to an increase in visitor parking. Regular operating expenses went down. This is why permit prices did not increase, remaining the same for a third year in a row. Any money left that exceeds current obligations will go toward design and construction of future decks. The next project is an expansion of Union Deck, set to begin this summer. Citation proceeds for 2014-15 was $117,424 ($14,653 more than 2015-16). *Citation fine proceeds are governed by a State statute (GS 115C-457.1-3 – p. 305) which says that civil fines (i.e., parking tickets), minus the cost of collection, have to be remitted to the State of North Carolina, which then allocates the money to local K-12 public schools. The cost of collection cannot exceed 20% regardless of how much is actually spent to provide enforcement and collect the fines. Unfortunately, it costs PaTS more than the 20% they're allowed to keep to cover the cost of enforcement. Also, as part of a pilot program, visitors will be able to use the app when parking in any unrestricted parking space in the Greek Village lot. This area will be monitored for use and will allow the University to plan for future program expansion to other campus lots. Customers can pay to park with their smartphones using Parkmobile’s app for iPhone, Android, Windows, Amazon, and Blackberry phones, or by calling the toll-free number on the green meter stickers and signs. Additionally, customers who are using the Park It! Charlotte app, may use the app on campus, and Parkmobile users may use their app in the city of Charlotte and many other locations across the country. Parkmobile’s mobile payments system is very simple and easy to use. Customers first must register by downloading the mobile app from their phone’s app store or online at parkmobile.com. Once registered, they may immediately use the mobile app, Internet, or the toll-free number listed on signage to pay for parking. This Parkmobile service also provides customers the ability to receive alerts when their meter time is about to expire, extend their time remotely without returning to the meter, utilize credit cards in locations that do not offer manual credit card payments, as well as print and keep receipts for parking. This mobile payment solution is an option intended to complement existing parking payment options; existing forms of payment are still valid for use. Mobile payment at a metered space does not change the reading on the meter but enforcement devices are able to see that a motorist has paid. This option is not yet available for visitor parking in any of the decks but will be added to additional parking areas across campus as the program grows. Lape adds, “Mobile payment is one of a number of innovations PaTS expects to roll out in the next year to better use technology for more efficient and convenient parking on campus." 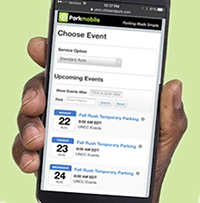 Parkmobile, LLC is the leading provider for on-demand and prepaid mobile payments for on- and off-street parking. Their services have been adopted in more than 2,000 locations, including 36 of the top 100 cities in the U.S. by millions of registered users. Parkmobile’s services include on-street parking, off-street parking deck, airport and event reservations and municipal parking permit solutions. Parkmobile serves over 20 airports as well as provides reserved parking solutions for private operators, the Super Bowl, the College Football Championship Series, Fenway Park, FedEx Field and Nationwide Arena, to name a few. More information at parkmobile.com. 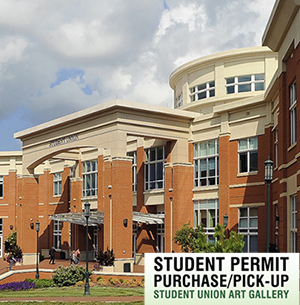 UNC Charlotte parking permits are required to park anytime the University is open and will be enforced on the first day of class. If you have not already done so, purchasing online is the easiest way to get your permit. We’ll have it waiting for you in an express pick-up line! 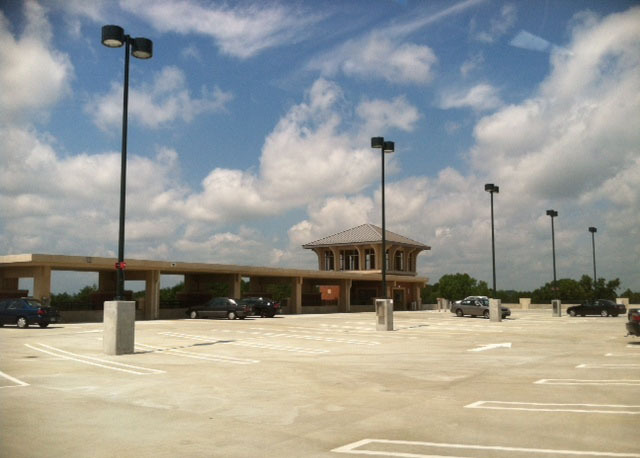 You may buy a temporary permit from clickandpark.com for $4.00/day that will allow you park in North Deck for up to four days, Monday, Aug. 22 – Thursday, Aug. 25. Details below. Temporary permits are also available for purchase in person from Parking and Transportation Services. Temporary permits are not valid in visitor parking areas and do not work in gated decks or lots. Price for these permits is $6.00/day. Peak parking demand will occur Monday – Thursday, 9:00 AM. – 2:00 PM (based on class schedule). The Parking and Transportation Services Call Center is open weekdays, 5:00 AM Monday continuously through 10:00 PM Friday to answer any parking or transportation related questions or concerns: 704-687-0161. If you need to park for short-term loading/unloading, call 704-687-0161 for permission and direction. Gated lots and decks will be restricted to those with gate access from 5:00 AM Monday continuously through 10:00 PM on Friday evening, except during holidays when the University is closed. PaTS is offering $4.00 temporary permits online for parking in North Deck for the first four (4) days of class (Monday, Aug. 22 – Thursday, Aug. 25). This option gives a $6.00 savings over the Visitor parking day rate and frees Visitor decks/lots for those who need short-term parking. 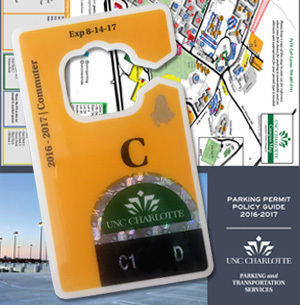 The temporary North Deck parking permit can be purchased at: https://uncc.clickandpark.com; choose the “Fall Rush” permit option for the needed dates. Print the permit and display on your vehicle’s dash while parked in North Deck. An express shuttle will be provided between North Deck and the Student Union from 8:00 AM – 5:00 PM, Aug. 22-25. The campus Green Line shuttle also serves North Deck from 7:00 AM until 9:30 PM Monday-Friday. SafeRide evening transportation serves all of campus from 6:00 PM until 2:00 AM seven days a week. Program expires on Thursday, Aug. 25 at 11:59 PM. Vehicles without the proper Resident, Commuter, or Faculty/Staff permit are subject to citations after this time. The State of North Carolina now requires mopeds to be registered with the state (§ 20-53.4). As a result, UNC Charlotte has instituted a policy that requires mopeds to be treated like motorcycles in relation to parking policies and procedures and has added designated motorcycle/moped parking areas in lots across campus. Mopeds are now required to have a UNC Charlotte digital parking permit, as is required for motorcycles. MOPEDS ARE NO LONGER PERMITTED TO DRIVE ON SIDEWALKS OR PARK IN ANY AREA OTHER THAN A PROPER PARKING SPACE. Mopeds may not park in bike racks. Failure to follow policy may result in fines and/or immobilization/impound. Detailed motorcycle/moped policies, permit options, and a list of designated motorcycle/moped locations is available on the PaTS website. To register a moped with the State of North Carolina, please see the NCDOT website. PaTS is pleased to introduce a mobile payment app that allows visitors to pay for parking, extend a metered parking time, receive time expiration alerts, and view receipts. The Parkmobile payment app is a free download available at Android and iOS app stores. When using mobile payment, there is no need to use the parking meter in the lot. The mobile payment option will be added to additional parking areas across campus as the program grows. It is not currently available for Visitor parking in any of the decks. A limited number of discount remote parking permits are still available to commuters for Lot 6A (corner of Cameron Blvd. and John Kirk Road, served by the campus shuttle). Permits are to be displayed from the rearview mirror or on the driver’s side dash in a PaTS-approved clear pouch. The entire permit must be visible. Dash pouches are available from the PaTS office at no charge. Typically, parking demand is exceptionally high during the first two weeks of Fall semester, particularly at Union Deck. Plan to either arrive before 8:00 AM or park in a lot toward the margins of campus and utilize the shuttle in to the center of campus. Parking is expected to be especially tight on Monday, Aug. 22 due to New Student Convocation and Tuesday, Aug. 23 due to the first full day of classes. Decks and lots closest to the center of campus fill quickly and early. Union Deck, East Deck 2, West Deck, and the lots closest to those decks, are often at peak capacity by 8:45 AM. Be prepared. Have a plan in mind for alterative parking if your first preference is full when you arrive. Parking map. Don’t circle a full lot or deck! That only adds to traffic congestion in or near parking decks and lots. Move to a lower-demand area such as North Deck, CRI Deck or Lot 6 (on Cameron near Campus Edge apartments). More detailed information on lot utilization is on our website. There are shuttle stops nearby for transportation to the center of campus if you don’t wish to walk. Peak traffic times are 7:45 AM – 9:15 AM and 5:00 PM – 6:00 PM. All shuttles from off-campus housing complexes must load and unload passengers at the bus loop of East Deck 2 only, entering at the Main Entrance and exiting via Van Landingham Road. Students utilizing private shuttle services are advised to leave early due to campus congestion during the first two weeks of classes. If leaving campus between 5:00 and 6:00 PM, avoid exiting to John Kirk Drive by way of Van Landingham Road near Fretwell. Try using Mary Alexander Road to Mallard Creek Church Road or the bottom level of East Deck 2 that exits to Rt. 49 South (University City Blvd). If arriving on campus between 5:00 and 6:00 PM, avoid the John Kirk Drive Entrance at Van Landingham Road (near the Circle K). Instead, enter campus by using Cameron Blvd., the Front Entrance, Mary Alexander Road, or the bottom level of East Deck 2 from 49 South (University City Blvd). 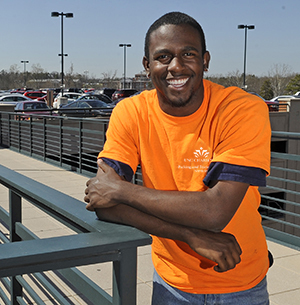 Follow @unccparking on Twitter. PaTS uses Twitter to inform of detours, delays, and other relevant information. For those who don’t use Twitter, the same information is fed directly to the PaTS website home page. Full service begins Monday, Aug. 22. Campus Shuttle stop lists and route maps are available online. 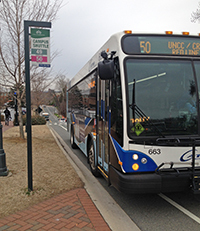 This service is fare-free to all UNC Charlotte students, faculty/staff and visitors. 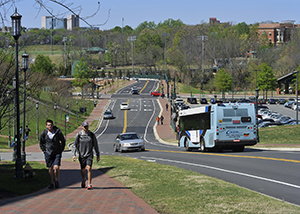 Some changes have been made to campus shuttle routes that should yield major improvement in service. SafeRide vans will be running modified Red and Green Line routes in the evening to make evening safety transportation much more efficient and extend shuttle service until 2:00 AM with weekend evening service, too! See pats.uncc.edu/transportation/campus-shuttle for more information. Real-time campus shuttle and SafeRide Evening Safety transportation tracking and arrival information is available via smartphone or website with the UNCC NextRide app (FREE at Android and iOS app stores) or nextride.uncc.edu. 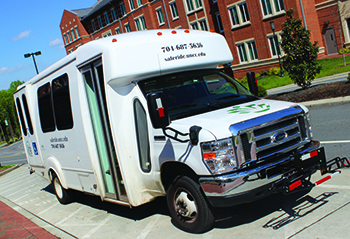 SafeRide provides disability transport throughout the inner core of campus for those with mobility impairments who have registered for the service, Monday – Friday, 7:30 AM – 5:30 PM. Services require registration through the Office of Disability Services and completion of a Disability Medical Verification Request form. SafeRide is also available to those who need assistance on a temporary basis (such as recent surgery, lower limb injuries, visual impairments, or chronic diseases that impact stamina). This is also arranged through the Office of Disability Services, Fretwell 230 (704-687-4355). After completion of the required form, Disability Services will verify and send email confirmation of eligibility (usually processed within 24 hours or less). SafeRide Evening Safety Transport makes getting around campus safer, faster, and easier after dark. Service runs seven days a week, 6:00 PM – 2:00 AM, picking up those waiting at marked stops on a continuous looping route. Vehicles keep moving and do not arrive or depart at set times. Details regarding SafeRide Evening Safety Transport, including a list of designated stops and route map are available on our website. SafeRide shuttle tracking and arrival information is available via smartphone or website with the UNCC NextRide app or nextride.uncc.edu. For specific inquiries and concerns, the PaTS call center is available 24 hours on weekdays, 5:00 AM Monday through 10:00 PM Friday at 704-687-0161, or utilize the contact form on the Parking and Transportation Services website or email:pats@uncc.edu. We're also on Twitter @unccparking. Parking Permits for 2016-17 are available for online purchase now. The deadline for students to have permits mailed to them is 11:59 PM Wednesday, Aug. 3. PaTS strongly recommends early permit purchase. Putting off buying a permit until just before classes start usually means a long wait in a very long line. Students who are able to buy their permit before the mailing deadline enjoy the convenience of having their permit in-hand by move-in and first day of class. But wait! There's more! Student permits ordered between June 1 and Aug. 3 will be automatically entered into a drawing. Two names will be randomly drawn; the winners will get a full refund on the permit charge! Drawing limited to registered students. UPDATE: Congratulations to the winners of this year's free parking pass drawing, Sean Doig and Tyler Powell! 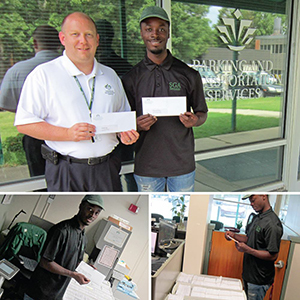 Special thanks to Student Body President Fahn Darkor (pictured with PaTS Director Doug Lape) for helping us pick the winning envelopes. 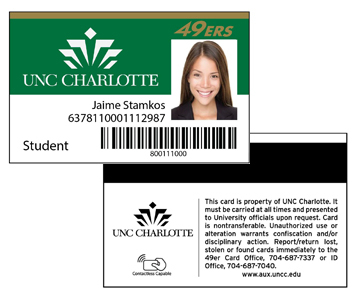 49er ID Card going "contactless"
Business Services and the 49er Card Office are phasing in a contactless ID card for campus beginning June 6, 2016. Card ID Number - This number will no longer be the Banner 800 number, but instead an ISO number. The ISO number is a secure, unique number generated when a card is issued or reissued. The 800 number will also be printed on the card and encoded in the magnetic stripe. Contactless Chip - A chip embedded in the card allows for tapping at contactless terminals. 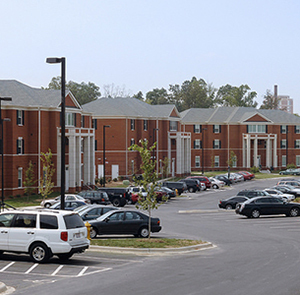 Most residence halls and point of sale registers will be contactless-enabled by fall. Academic building door access and some other systems will accommodate contactless in the future. Contactless ID cards will be issued the the remainder of campus throughout the fall. Later, CATS ridership privileges may be loaded on the card upon opening of the LYNX Blue Line extension. Parking and Transportation Services will provide modified shuttle service during first and second summer sessions. Summer shuttle will be run internally by PaTS, using SafeRide Evening transportation vans. Summer shuttle will cover the same route and stops as the Red and Green lines do during Fall and Spring semesters. * (Green Line connects South Village and North Campus to campus core; Red Line goes cross-campus, from Lot 6 at John Kirk and Cameron to East Decks, Student Union and CRI.) Summer Shuttle route and service stops. Shuttle vans will be labeled and show on the UNCCNextRide app and mobile web as Green and Red routes. After 6:00 PM, SafeRide evening service will take over, returning to the established campus loop. "This is a pilot program," said Helena Connors, Transportation Manager, "in response to requests from students and the Office of Disability Services." Doug Lape, PaTS Director, adds that operating a shuttle over the summer, "will help as we gear up for light rail in August of 2017." Regular campus shuttle service, operated by Charlotte Area Transit, will resume Monday, August 22. * Route service may require temporary detours due to construction. Murray KY: Nicholas Brawner, Catering Chef for UNC Charlotte Center City, earned a Silver Medal in a culinary challenge held March 22, 2016 at the Southern Regional Conference of the National Association of College and University Food Services (NACUFS) at Murray State University. Brawner's dish was a rendition of Saag Paneer (a classic Indian dish of leafy greens and fried, fresh cheese) with Carrot Chutney and Coconut Roti (a griddle-baked bread). The recipe included black kale, edamame and red rice. It was one of six chosen from over a hundred entries to compete in the NACUFS Culinary Challenge event. Brawner and five other chefs had 60 minutes to display culinary skill as they prepared qualifying recipes in front of American Culinary Federation-approved judges. Other chefs who competed were from Vanderbilt University, Georgia Tech, University of Georgia, Tulane University, and the University of New Mexico. The judges were looking at organization, technique and taste and were impressed with how Chef Nick made a flour from red rice to create the roti. If he had prepared the rice in a traditional way, the time limit would not have allowed for thorough cooking, (as some other contestants unfortunately learned). "I am a Southern chef who grew up with fresh heritage cooking," said Brawner in his application bio. "I began cooking at an early age with a tough lady — my grandma — who worked a family farm growing up. [She] knew and understood food, and later studied and became a food chemist. This changed the way I looked at food and I credit her for the interest I have today." This is the second year in a row that a UNC Charlotte chef has brought home silver from the annual event. Just in time for upcoming exams, a study and office supplies vending machine has been installed on the main floor of Atkins Library. 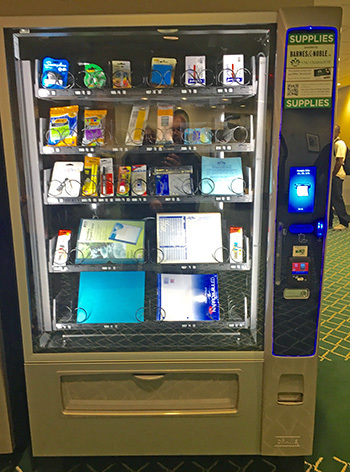 The machine offers convenience purchasing of often needed items such as pens, highlighters, flash drives and exam books. The machine accepts cash and the 49er card and is operated by Barnes and Noble at UNC Charlotte. Remember, UNC Charlotte has a full-service postal facility on the lower level of Prospector. Mail & Package Services also manages Union Station, on the main level of Student Union. There you can get stamps, ship packages (via USPS and UPS), get signs and banners made (graphics services list and prices) and even get your U.S. Passport prepared. Read about Union Station services.